Sheila Farebrother told The Sun she had been cut out of the Candle In The Wind star's life for good. The 86-year-old said there were no plans for her to meet grandson Zachary, who was born to a surrogate mother in December. Widowed Mrs Farebrother would not tell the newspaper what had caused the rift but said it was a "painful subject". She said: "He has cut me off completely. It happened three years ago this June. He has had nothing to do with me since then." Last year Mrs Farebrother sold a cache of her son's memorabilia - more than 200 items - which she said was due to downsizing after moving to a seaside bungalow. 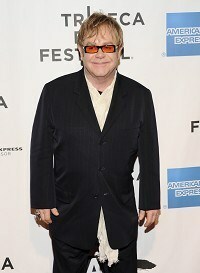 Sir Elton and his civil partner David Furnish became parents when Zachary was born on Christmas Day. His mum told The Sun she had "no particular interest" in meeting her grandson. Mrs Farebrother said her son continued to support her financially and added: "I don't want to start mudslinging." For many years she was a director of one of Sir Elton's companies and was a witness when the millionaire musician married David in Windsor in 2005.